After a quarter of a century, Newberg and McMinnville will no longer host their own, separate Relay for Life events. Instead, the two are returning to their roots and merging into one event. And the one event will bring back the original name, the Yamhill County Relay for Life. Jami Fuller, chairwoman of the Yamhill County Relay for Life, said while this was done in part because of dwindling participation at both events, it was also something organizers had been considering for a while. She added that since it did start out as a single, combined event, it made sense to re-merge the two into one. It will also aid in fundraising and cut down on organization and event costs, thereby guaranteeing the greatest amount of money can be donated to the American Cancer Society, officials said. "The bigger event we can plan is a more fun atmosphere," she said, adding that their new tagline was "We're better together." In Newberg, attendance dropped considerably to 68 participants in 2018, down from the previous year's 230 people. Fuller said she didn't have the exact fundraising numbers for the two communities, but estimated that each brought in about $30,000 each. Over the years, she estimated the two events have helped raise "hundreds of thousands of dollars" and although there is no fundraising goal for this year, she stressed having a singular event can help cut costs to help raise more to fight cancer. "We want to make this merge as easy for everybody as possible," she said. "It was held on the same date every year, and we're just joining forces and making it a bigger and better event. We want to make this a positive thing." Carole Elbert, who co-chaired the Newberg event last year with her sister Janice, said the Newberg Relay had seen a big dip in volunteers, which made the event difficult to stage with many volunteers working multiple positions. She said in addition to lowering overhead costs, the hope for a county-wide event is to get other counties involved in the events. She said the Newberg Relay had also seen a two-year decrease in participants, but added it has proven difficult to get people involved without volunteers. "If you don't have volunteers you're not going to get community involvement," Elbert said. The joint Relay for Life will be held from 11 a.m. to 11 p.m. June 22 at the Patten Middle School in McMinnville. After opening ceremonies there will be a survivor and caregiver walk. Then there will be a luminaria ceremony and a demonstration of remembrance for anyone affected by cancer, followed by closing ceremonies. There will also be a 5K race/walk at the Evergreen Nature Trail in McMinnville on Thanksgiving Day. Registration is at 7:15 a.m. and the event starts at 8 a.m. To register, visit https://bit.ly/20ywTk9. Fuller said this is the first event of the year, though they have many more planned. While she didn't have dates or specifics on future events, there will be dining out nights in both communities, where some proceeds from the participating restaurants go to the cause. She also said there will be a community garage sale, paint nights and there will be a large fundraising event in the winter. 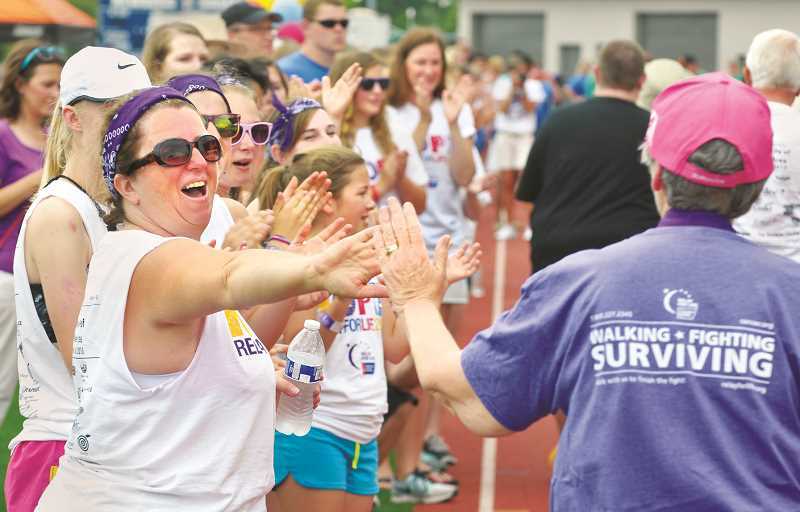 It's not uncommon for neighboring towns to merge efforts for Relay for Life. Earlier this year, Canby and Molalla combined their separate events into the Relay for Life of South Clackamas County. Tigard and Tualatin also host joint event. Fuller said the plan is for McMinnville and Newberg to alternate as hosts each year.